Given that I am lucky enough to live in a tourist hot spot, I thought it might be useful to outline some things to do in the region for those with small children. Recently, we found ourselves in Exmouth. Having visited my elderly grandparents for an hour, I wanted to treat E and B for the rest of the day so we went to the World of Country Life. The attraction includes animals, a deer safari (which we didn't have time for), a museum, and lots of play areas. The first thing you get to is the undercover museum hall, which includes lots of old farm machinery and steam engines (not just rail). E has shown a great interest in trains recently and we had just been reading a book about the history of rail, so he was fascinated to see the steam engines and what made them work. We then wandered into the Victorian street and I enjoyed showing both children how many toys in the Victorian toy shop were similar to today (pram, bike, scooter, toy cars, dolls). We had a little chat about the differences in toys between then and now. However, the sun was shining and, having already spent a good part of the morning inside with historic artefacts (sorry Meme and Grandpa), we were all keen to get outside and enjoy our picnic lunch. The World of Country Life is ideal for picnics with plenty of tables outside (and under cover). Unlike many attractions, you really don't feel obliged to buy overpriced food from the actual venue. During the picnic, we looked around at the outside play area and soon E and B ran off to enjoy the climbing frames, slides, swings, roundabouts and assault course. There were also some trampolines, but strangely neither of my two were particularly fussed about going on them. After about half an hour of letting off steam outside, we decided to go and look in the animal paddocks. I was slightly disappointed by the range of animals. The name World of Country Life suggests a variety of farm animals, rare breeds, and wild animals but we only really saw Guinea pigs, ducks, goats, pigs, sheep and rabbits. I believe there are other fields containing larger animals, but we didn't get that far. We then went into a petting paddock where the children were encouraged to go into the enclosure with the goats and pet them. Both E and B were a little nervous, but Elliot picked up enough courage to stroke and even feed a goat. We then had a quick look at some of the birds of prey before the children wanted to play again. 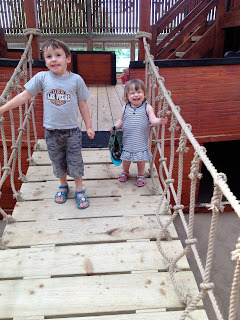 This time, rain appeared to be threatening, so we went to a big shed which housed a huge Pirate Ship and both E and B had enormous fun exploring, clambering and running around. I eventually managed to persuade them to move onto something else by promising them the soft play areas and bouncy castle. These are also undercover, which makes the World of Country Life ideal for a wet day. B had a brilliant time in the ball pool and slide while Elliot discovered the racing track (which costs extra - £1 per ride in a car) and tried his luck as an F1 driver. We then moved into a smaller children's play area with lots of ride on toys and a bouncy castle. Throughout the day, there are various activities, which we didn't take advantage of because we were having too much fun just playing. These include a birds of prey display and feeding times and shows such as ferret racing. We also missed out on the Deer Safari (which I also think costs extra) due to time constraints. Although there's plenty to do I thought some of the attraction looked a little tired for the entry price. But overall, I think it was worth the cost for the entertainment (purely because we didn't have enough time to do everything). I think we would come here again in the future. We visited on a Thursday during term-time.